Thanks for such a thorough blog post, and I hope we’ll be able to connect. Since Intuit’s November 2009 acquisition of Mint.com, I’ve been working with the new Personal Finance Group (Quicken – for Windows and Mac, andMint.com). I would love to set up a time for you to speak with Aaron Patzer, the new GM/VP of Personal Finance for Inuit, to hear what the product team has done for Essentials (Mac native, mother-of-all-converters, upgraded ease-of-use, etc. ), and what he and the team are already working on for future releases. The team’s only been merged for 3 mos., but I assure you bringing parity among products is a huge goal for them and we’d be happy to discuss what that would mean. Please let me know if you have time in the coming days. My cell is: [phone withheld], or you can email me at: [email withheld]. I would welcome the opportunity to discuss the future of Quicken for Mac. Obviously, people are very passionate about the product and when you combine that with the passion people have for the Macintosh, you get one volatile combination. Let me know under what restrictions, if any, you’d be open to having this discussion. I would of course love the opportunity to not be tied to NDAs and be able to report honestly about the situation going forward on my Blog. Let me know how you’d prefer to proceed. I can send you a beta copy of the new release on Tuesday, and totally get the passion. I actually made a collage to illustrate that exact point (attached) when we realized what stage we were stepping into with this product’s story. Re: NDA, no holds barred. The official launch date is 2/25 2/22, but if you have musings, would like to write about your conversation with Aaron Patzer or others on the Mac team, we welcome it. Definitely want you and your peers to know this is a priority. Do you have time Monday 11 – 11:30 a.m. PT to chat with Aaron? So, now we know. 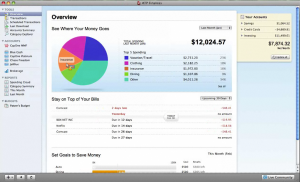 Quicken Essentials 2010 for Mac will be released on February 25th 22nd. I also had a date and time when I was going to get to speak with Aaron. I spent the weekend thinking about the questions I wanted to ask and the answers I wanted to receive. Aaron and I spoke on Monday at 2:00 p.m. EST. We fired up a screen sharing session and he immediately started into a demo of the new Quicken Essentials 2010 for Mac. I wasn’t able to drive, but I did get a screen capture. Quicken Essentials will auto-categorize transactions that you download, with a 70% accuracy rate. It will also “cloud source” categories to improve accuracy (you can override of course, and it will remember for your accounts). These categorizations are being driven from Mint.com which already has this feature. Will have the “Mother of all Converters”. At first, this really didn’t seem interesting to me, my data is in Quicken already. However, when I pointed that out to Aaron he took the time to explain that the exporting and importing process of Quicken, today, is cumbersome. Which it is, I can attest. If you’re switching from Windows Quicken to Mac Quicken, or Mac to Windows, you often have to do it an account at a time, via QIF (Quicken Interchange Format) files. This causes all kinds of havoc with multi-account splits, categories, etc. I’ve done it before (both ways) and it’s not pretty. I’m also doing it right now to move data into iBank for that product review. The new Quicken Converters will read the native binary data formats, for a bunch of different Personal Finance software, and bring it into Quicken. That’s actually really nice. Ad-Hoc Reporting much better, more on this below. Tagging of transactions, more on this below. Portfolio updates to online Brokerages (like E*Trade), don’t get too excited. Basically, just like at Mint.com, you can connect your existing online Brokerage account into Quicken. It will then pull current balances and Portfolio values down into Quicken. If your brokerage is supported, that’s great. If it’s not, then you basically can’t use this feature as manually entering buys and sells of equities isn’t something Quicken Essentials is going to do. The reporting environment in Quicken 2007 for Mac blows. It’s horrible. It’s barely usable. It was okay when it was first released in 2006, but four years later we just have much higher expectations for what our software can and should do, and it’s not doing it. Quicken Essentials 2010 for Mac shines in this area. It’s extremely visual (you can see that from the screenshot) and Aaron zipped around the screen getting all kinds of information about his finances and transactions. Because of this rich data, the budgeting was actually something I might use. I mentioned to Aaron that all of the reporting felt “very Mint-like” and I could hear him grin on the other side of the phone. He agreed. If you’ve used Mint.com, then you’ll already know what to expect and probably know how to use it. It’s clear that Mint.com is already having strategic impacts on the direction Intuit is taking Quicken. If you haven’t used Tags in your applications, then you’re missing out. Tagging is something that started in social networking on the Internet and is now finding it’s way into mainstream applications on our Desktop. A Tag is basically another category. They’re lightweight and made to be used more as a filter than as a true categorization. The simplest example I can make is that if you eat at 5 restaurants a week, you’d want all of those categorized as Dining. However, 2 of those meals were lunches, three were dinners, and 1 of them was reimbursable by my employer. I’d categorize all of them as Dining, but I’d Tag the first two as Lunch, Tag the last three as Dinner, and Tag the last one as Expense Report. So the first two would only have 1 Tag, the next two would have 2 Tags, and the third would have three Tags on it. The power now comes from the fact that I can have Quicken report on certain Tags and pull those transactions together based on different criteria than just Category. Now I can find out what percentage of my Dining are Lunches (something my wife thinks we should cut down dramatically). I can also easily pull a report together for my business Expense Report. It’s powerful and I’m glad to see it in this type of product (thanks Mint.com). I asked Aaron about the future of Quicken. I bluntly told him we want a product that is in parity with the Windows version of Quicken. He understood. He also explained to me that he’s only been in the job since November, 2009. When he took the reigns of the Personal Finance division at Intuit, he was shocked that there hadn’t been a Quicken product for the Mac for four years. He was immediately indoctrinated into the saga that is Quicken for Mac. His first priority was getting a product out the door. A quality product. Even if that meant sacrificing features at first. Four months later, we’re getting the first new Quicken product for the Mac in four years! That part of this story is a success. Yes, I’m clearly displeased with the fact that major features were left out. Features that you’d think they already had code and support to enable in the new product. But, it’s a new product nonetheless. Aaron then shared with me that his goal for the Personal Finance group is to in fact bring parity to all of the Quicken products. But, Intuit is doing this differently than you’d expect. Instead of the Windows Quicken being the milestone and bringing the Mac product up to spec, they’re instead working towards a seamless integration of all the Quicken products. Intuit wants you to be able to get your personal finances, transactions, categories, and reporting, from any device you choose to use. That could be a Macintosh client, a Windows client, your web browser, or your PDA/SmartPhone/iPad, etc. They want the experience in all of those mediums to be the same. That’s a lofty goal and not necessarily one that the consumer is going to be comfortable with. I for one used to be a Mint.com user, but after getting all of my information loaded into Mint.com and playing with the reporting, categorization, and data visualizations, I quickly realized that this company now had complete and total access over everything I was doing. I deleted my account (which they completely support, knowing that people can get nervous about it). When I mentioned this to Aaron, he was quick to point out that the seamless integration is for folks who want it, you won’t be forced into it. I’m sticking to my guns on this one. I appreciate the time Aaron took and I hope the above article puts some people at ease. I was told Intuit was going to send me a beta of Quicken Essentials 2010 for Mac on Tuesday, no one contacted me about it, and I didn’t get a response to my follow-up email to Martha (by the time of this post). I plan on reviewing the final product when it’s released as a comparison to the article I’m working on for iBank. As a Quicken user, I’m going to have to look hard at what I actively use within Quicken to see if Quicken Essentials is a fit. Aaron did share that Intuit will be having additional “SKUs” for Quicken Mac that will include “Advanced Features”. He didn’t allude to when those would be released, or what features would be included. If you as a user of Quicken actively use Portfolio management (not at a support brokerage), actively push your data into TurboTax, or currently use Quicken Bill Pay through the application (not your bank), then this product is a pass. If however, you don’t use those features, then you might like it. I’m thinking hard, but I’m not pre-ordering Quicken Essentials either.